A paper published in the current edition of the journal Neurophotonics describes a new nanosensor design that enables more accurate mapping of the brain and shows the way forward for future sensors and a broader range of applications. The journal is published by SPIE, the international society for optics and photonics. This is a technological breakthrough that promises to shed new light — both literally and figuratively — on understanding brain homeostasis. A new optical nanosensor enabling more accurate measurement and spatiotemporal mapping of the brain also shows the way forward for design of future multimodal sensors and a broader range of applications, say researchers in an article published in the current issue of Neurophotonics. The journal is published by SPIE, the international society for optics and photonics. 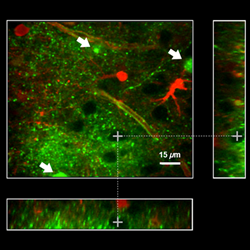 The work by Joel Wellbourne-Wood, Theresa Rimmele, and Jean-Yves Chatton is reported in “Imaging extracellular potassium dynamics in brain tissue using a potassium-sensitive nanosensor.” The article is freely available for download.